Maybe he was looking for me, maybe he was freaked out by Ex moving things out of the house. Loki had certainly not had time to bond with Ex the way he did with me. Who knows, but when I came back home, not only had my husband left me, but my sweet Loki was missing also… I held out hope for many weeks that he would turn up. He never did and I eventually gave up. There was a wooded area down the street where coyote’s lived and I assumed they got him… After we returned from our trip to Colorado over the summer my kids were down the street playing with the neighborhood kids who lived there and the kids claimed they had seen our cat Loki… I didn’t want to believe them at first, I certainly didn’t want to get my hopes up, after-all how could Loki still be alive, he had been missing for 5 months? I found a picture of Loki on my phone to show the kids and they were sure it was him. Still skeptical I was eventually able to show the picture to the kids mother, whom had also seen the cat and said they had been feeding him tuna. The mom also said she was sure it was Loki!! I was in disbelief and so excited at the possibility of getting him back! For the next week, a few times a day I would take a break from packing and my kids and I would walk down to that part of the neighborhood looking for Loki, calling out his name and even taking cans of tuna in hopes of luring him out. NOTHING… I didn’t want to give up, if Loki was still out there I was determined to find him. Finally, I decided to make flyers and I made one for each house around the area, about a dozen flyers and the kids and I walked around putting a flyer on each door. Then we waited, and waited… Several days went by and I didn’t hear a thing, then one morning at 7 AM my phone rings, “I think I have your cat, he is in my garage” I was absolutely ecstatic!!! Sure enough, I went to the house and it was Loki, a little beat up and quite dirty, but it was him!!! My kids were just as excited as I was!! I couldn’t believe I got him back after he was missing for five months. 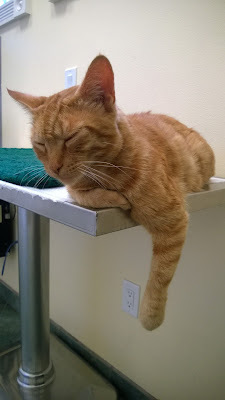 I took him to the vet that day to make sure he was okay and other than some fleas he was fine! Finally, home safe and happy as can be!